In this unique session, Ricoh will introduce Embedded Software ArchitectureTM, a Java technology-based development platform, which allows independent software developers to pioneer innovative software solutions for the Ricoh devices. This Java platform overlays the BSD-Unix core architecture, which controls all device functions. As the 'best supplier of Linux printers' (according to Linuxprinting.org), Ricoh would like to challenge all Linux developers to explore the possibilities to integrate KDE with the Ricoh platform. Mr. Jin Yoon is an Assistant General Manager and Senior Solution Consultant for Ricoh Europe B.V. He joined Ricoh Europe in 1987, shortly after completing his computer science education in The Netherlands. During his career at Ricoh Europe, Jin Yoon has always been at the forefront of pioneering emerging technologies, ranging from Document Archiving and Color Printing Systems, to Software Solutions. 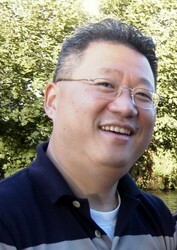 In his current position, Jin Yoon is responsible for Evangelizing Ricoh Embedded Software Architecture through the Ricoh Developer Program, a partnership program aimed at encouraging developers to integrate new and existing solutions with Ricoh hardware and software products http://emea.ricoh-developer.com.